Setting up a Raspberry Pi with wireless is easy enough with the right USB WiFi dongle. Not just any dongle will work since the Chipset must be compatible. Common Chipsets are RTL8188CUS, RTL8187, and the Ralink RT5370 and others. There are other compatibility issues when it comes to the Pi mainly the power supplied to run the dongle. This has become less of a issue than the early days of the Pi when USB hubs often were used to boost the USB power. Many wireless dongles have been used with the Raspberry Pi and have been confirmed as working. Remember depending on the Distro that is used there can still be compatibility problems. While one Distro can be Plug and Play with one adapter another Distro may have problems. As always be sure to read the reviews on Amazon or elsewhere to be sure a adapter fits your setup. The Panda Panda PAU05 is a small unit that uses the Ralink RT5572 Chipset. It is a widely used chipset with Linux and wireless penetration testing. It is a good low-cost unit that works well with the Pi. The Edimax EW-7811Un is a Wireless-N dongle that works with the Pi. It works only in the 2.4 GHz range. The chipset is the Realtek RTL8188CUS which also is compatible with many other operating systems. If you need a small cheap WiFi dongle for your RasPi than this is a good one to get. The Panda PAU03 is another small cheap RasPi compatible WiFi dongle. It is a basic wireless-N, 2.4 GHz dongle. The thing that makes it stand out is the variety of operating systems it is compatible with from the Raspberry Pi to Windows 10. It is a good USB adapter to have around to get quick wireless on most any machine. The Alfa AWUS036H is a good adapter that is very popular in the Pen Testing community. It is able to go into monitor mode which is necessary to hack WiFi signals. It is only a 2.4 GHz wireless-G USB adapter which uses the Realtek RTL8187L chipset. Different sized dBi antennas can be used with the AWus036H which gives it good distance. While it is starting to show its age it is still a good USB adapter to use with a RasPi. The Netis WF2150 is a Dual Band 2.4 GHz \ 5GHz USb dongle. It uses the Ralink RT5572 Chipset and is a Wireless-N adapter. If you need an adapter to work in the 5 GHz range than this is worth taking a look at. 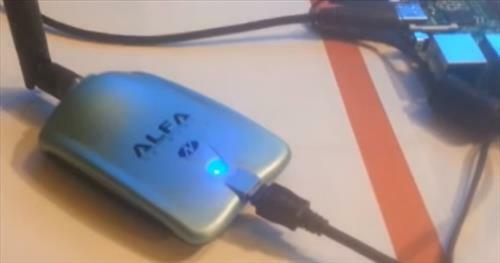 The Alfa AWUSO36NH is another Pen Testing USB adapter that works good with the Raspberry Pi. It uses Wireless-N at 2.4 GHz. Like most Alfa adapters the antenna size can be swapped out for better range. This generic USB adapter was built specifically with the Raspberry Pi in mind. It uses the RaLink RT5370 chipset and has been tested with a variety of operating systems form Raspbmc to OpenElec. A 2dBi antenna is included and is a 802.11n, 2.4 GHz dongle. The Edimax EW-7811UTC has been known to work with the Raspberry Pi after installing the drivers. Some distos it will work out of the box while others it doesn’t. For those looking to get a 802.11ac USB dongle working with the Raspberry Pi this one is worth looking into. Remember the RasPi has a USB 2.0 socket which can only move data at 433Mbps. While this is a faster speed than Wireless-N max of 300Mbps, USB 2.0 cant take full advantage of 802.11ac speeds. This small dongle has been around awhile and works with many setups. This is a newer USB dongle that is sold as being Raspberry Pi capable. Since the the operating systems that run on the Raspberry Pi are based on Linux most USB adapters that run with Linux are also RasPi compatible. Keep in mind that the operating system being used can effect the dongle in some cases. While most driver libraries are simply loaded into most distributions there can be compatibility issues in some scenarios. For this reason be sure to read the reviews on Amazon or the forums to be sure an adapter is the right for for the distribution you will be running. Lack of 5Ghz chipsets, which is surprising because to be WiFi certified devices now need to be 5Ghz complient, and 2.4ghz is so crowded now it is almost unusable. I just lost one of my WiFi Dongles and want to buy a new one. Searching to find a good dongle for 802.11ac for PC and Pi and find there are still no information for 5Ghz chipsets, just like 5 years ago. I am using BrosTrend AC1L on my Pi based on Raspbian OS, this AC1200 usb wifi adapter supports 5GHz wifi and 2.4GHz wifi, comes with Realtek RTL8812AU chipset. good choice for me. I recently acquired a new PAU03 from Panda Wireless and the chipset was a 148f:5370 (Ralink RT5370), not a Ralink RT2870/RT3070 as mentioned in this article.